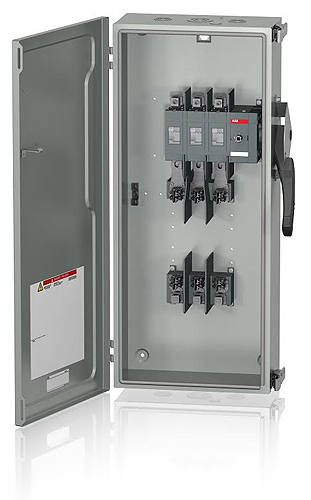 The ABB Low Voltage Products division in Canada, will be introducing in June 2014, heavy duty safety switches for commercial and industrial applications, meeting the necessary UL98, CSA and NEMA KS-1 standards for the most demanding service-entrance and motor-load applications. The 600V and 200kA rated switches use the same globally rated bodies as ABB’s rotary-style switches, providing increased performance, reliability and safety to the heavy duty market segment. They offer touch-safe visible blades and operating mechanisms that are fully enclosed and protected from dirt and debris. All enclosure types come with gaskets, are free of sharp edges and offer a spacious interior for easier and safer wiring and installation of optional accessories. The heavy duty safety switches range from 30 to 1,200 Amperes, and are available as fused and non-fused, with Types 1/12/3R/4X steel or stainless steel enclosures. They are suitable for many heavy commercial and industrial applications including heating, ventilation and air conditioning (HVAC), food and beverage processing, material handling and conveyors, water and wastewater treatment, commercial construction, marine, petrochemical processing and mining. The safety switches are maintenance-free and are fully field-serviceable, with the switch body, mechanism, fuse-holders, handle and enclosure door easily and quickly replaceable. .
Auxiliary contacts: mountable inside switch mechanism; same as those used with ABB rotary style switches, for lower cost and reduced inventory. Optional viewing window: factory installed in enclosure door to safely see status of switch inside without opening door. Fuse adapter kits: field adjustable to accommodate class R, L, J or T fuses.